I’m setting up a new laptop with Win 7. I have FF installed and running, but I can not get my bookmarks into the laptop. In the past, I have copied Places.sqlite to a thumb drive and pasted into the proper profile directory and that has always worked. I’ve tried importing from the thumb drive, but it will not recognize an sqlite file. To compound this problem, if I open Windows Explorer on the laptop I do not have an AppData folder on the new computer. If I search for Places.sqlite, it shows the path, but I can not get there. Why is the AppData folder not being shown? Then you can browse into it. But, I generally just Export and then Import the bookmarks within Firefox itself. That was one of the first things I did when I started setting this laptop up, long before I downloaded FF. Still can’t see the AppData folder. How do you export and import within FF itself? All I get is a blank box looking for html files. These two computer are not networked together. That’s another ball of was entirely. %appdata% got the AppData and Roaming folders to show. Thank you for that, but I still can not get my bookmarks in. When I try to paste the places.sqlite, nothing happens. > "Hide extensions for known file types" is UN-checked. I hope yours is as well. A very serious security blunder by MS....to have that option available & checked by default. LIMPET235 wrote: A very serious security blunder by MS....to have that option available & checked by default. Oddly enough, for Firefox users (for the last 10 years) it doesn't make the slightest bit of difference. 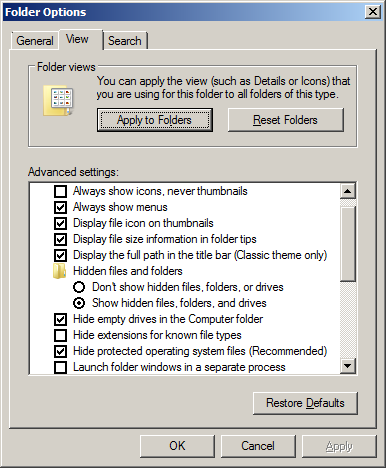 The mistake people have made is the assumption that profile access must be made via the full path in Explorer, when you do that then, yes, you need hidden folders showing. People then assumed, without checking, that if the App Data folder is hidden then so are all the folders and files within it, so we still get this 2004 advice trotted out all the time. But, that's not how you access the profile! Help > Troubleshoot Info > Open Folder and there's the profile folder, whether hidden folders/files are hidden or not. These days, we use about:profiles entered into the addressbar and open the profile that way. As for these bookmarks, go to profile, exit Firefox, delete existing places.sqlite and paste in new one. Don't forget that since Firefox 55, you also need to paste in favicons.sqlite the same way, but I don't bother as they get recreated anyway as you open the bookmarked websites. Sorry for taking this OT, but I think it's an important point, generally speaking. What if someone sends you an email & it ends in .txt .mov or .jpg. eg; "Hey (your name), take a look at this cute video or image or ?" on the end that is hidden by the Window's setting? Be interested to know about that situation. LIMPET235 wrote: Sorry for taking this OT, but I think it's an important point, generally speaking. That is the one that is simply inexcusable by Microsoft. Not only, as you pointed out, is that a real security problem that means that non-tech users cannot, effectively, open anything, but it also means that non-tech users will pretty much stay as non-tech users forever. Point is, even the most non-tech user is going to figure out in time that every file that ends in .pdf, .mp4, .png, etc always opens exactly the same respective program for the specific file extension each and every time. So, they learn in an easy curve and it means when someone says 'Don't click any file that ends in .exe' or 'I've just sent you a .pdf for your washing machine...' they then know exactly what you mean. There is no virtue at all in keeping people in ignorance for no good reason. Best to un-check that Window's setting. Just to be sure. dont forget to copy favicons.sqlite as since firefox 55 favicons are no longer part of places.sqlite. and there is a major change - files from v59 cant be used in v58/57. Well, it doesn’t make any sense that I need to delete places.sqlite before pasting the new one in, but it worked. I now have all my bookmarks in the laptop. Did the same with favicons.sqlite, tho I don’t know what that file does. Thanks for the help. Much appreciated. I think "favicons.sqlite" is where the favicons are stored. I only say this because if you delete it, all the favicons under Bookmarks revert back to the generic icons, and then that file is rebuilt when you restart FF. Just curious, why didn't you export your bookmarks to a file, and then import that file into your new FF on the laptop? darkrats wrote: I think "favicons.sqlite" is where the favicons are stored. I only say this because if you delete it, all the favicons under Bookmarks revert back to the generic icons, and then that file is rebuilt when you restart FF. Just curious, why didn't you export your bookmarks to a file, and then import that file into your new FF on the laptop? I’ve never been able to figure out how Import Export works. Much easier to copy paste, and kind of hassle as I have to do it with a thumb drive. I’m clueless as to how to network these two computers together.